WEDNESDAY tells us "I'm really excited for you all to see the video for 'Blood Sick'. It was all shot on green screen with director Matt Zane. 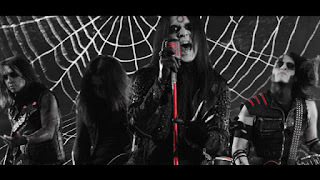 The song is about a spider torturing a fly in its web before devouring it, and I wanted to try and capture that scenario with the band in a giant spider web. I had this vision in my head when we first wrote the song and it's so cool to see it finally come to life." The album was produced, mixed and mastered by Chris 'Zeuss' Harris (Rob Zombie, Hatebreed) and the sleeve artwork was created by Travis Smith (Opeth, Katatonia). WEDNESDAY 13 is also confirmed to headline the Dogtooth Stage at Download Festival on Saturday 10th June with his full electric set, as well as two additional shows in Dublin (Thu 8th Jun at Voodoo Lounge) and Belfast (Fri 9th June at Limelight 2).